Is It Good? 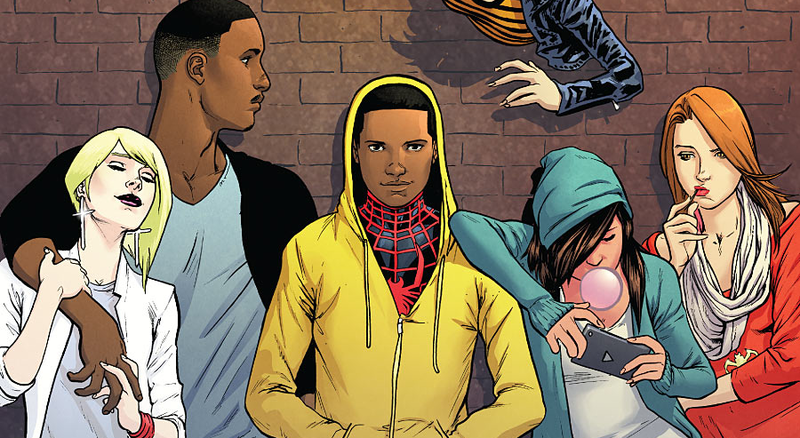 All-New Ultimates #1 Review – AiPT! After the events of the latest Ultimate Marvel event, everything has once again changed for the Ultimate Universe. Heroes died, the status quo was shaken up, comics ended, and now new titles have risen from the ashes. One such title is All-New Ultimates. Is it good? With the collapse of SHIELD, the Ultimates, and also the increase in super-powered thugs in Hell’s Kitchen, a couple of young superheroes decide to step up their game. The team consists of Spider-Man, Spider-Woman, Cloak and Dagger, and also Bombshell. Will they be enough to handle the new threats overtaking the streets? Hey, you guys have no one to blame but yourselves for wasting your time robbing someone who clearly wouldn’t have any valuables on him. I’ll admit: I’m a bit behind on what has been going on with the Ultimate Marvel universe — so I was going into this comic hoping it would explain some things or give a bit of background on what has been happening. To its credit, All-New Ultimates #1 does a fair job of introducing new readers to the world. It quickly mentions the events that happened before and introduces most of the team and what their powers are; quickly being the key word. The title would benefit from an introduction/recap page at the beginning like most Marvel books to fill in some extra details and clear some things up, like why Spider-Woman out of the blue (no lead up or anything) wants to be called Black Widow. The first issue is very fast paced and crams in a lot of material. Besides the brief introduction of readers to the new world it gets the plot going right away with the whole gang and drug scene, has the team get together, shows what the threat and villains are capable of, and introduces all of the characters and gives them some characterization. Though some characters are characterized more than others (we get more insight into Kitty Pryde, who isn’t on the team yet, than Bombshell, who is actually already on the team). It’s a good first issue that gets a lot of things done, but a little more backstory and fill-in would have been useful. How dare you try to give us food?! What a jerk. Michel Fiffe’s writing is perfectly fine. The pacing and storytelling hit the right balance. Every scene has some importance whether it be story or character related and scenes never feel like they drag on for too long. That being said, although the story flows well enough, it is often jumpy and feels abrupt in areas when the story changes scenes with little transition. Dialogue is alright, with a few good lines and character bits sprinkled in. The ending is alright, but it doesn’t really get you excited or shocked like other endings do. The artwork by Amilcar Pinna is what really stood out the most to me though about the book. It has a very colorful and bright color palette to it, giving it a very comic-y book feel to it more than most books. Layouts are alright, but nothing special. The action is nice and vibrant looking with the style and colors the comic has going for it. Though what I have to point out the most about the artwork are the characters themselves. Besides the costumes looking fine, the characters themselves do not look like who they are supposed to be. Kitty Pryde and Ganke get it worst, barely resembling what they look like in other books they appeared in. It was often very distracting. No kidding about using his left hand now. His right hand both looks burnt and broken! All-New Ultimates #1 is an okay first issue; while it does what most good first issues should do, it still doesn’t feel like introduces the audience well enough to this world (old fans should have no problem with that though) and the writing just feels rather average and typical. Hopefully as time goes on, this series finds its legs and really takes off.